Pottsville, PA, May 2010 - D.G. Yuengling & Son, Inc., America’s Oldest Brewery, and Orange County Choppers have partnered this summer to offer consumers the opportunity of a lifetime! While OCC has partnered with many companies in the past, this is the first time they have built a chopper for a brewery,” stated Lou Romano, Marketing Manager for Yuengling. “One lucky semi‐finalist will literally ride away with a piece of history, but everyone is guaranteed a memorable weekend. In addition, during this program, Yuengling will be donating a portion of company sales to the Intrepid Fallen Heroes Fund. The Fund has provided more than $65 million in support for the families of military personnel lost in service to our nation, and for severely wounded military personnel and veterans. The promotion will be supported by a Public Service Announcement for responsible drinking featuring Paul Teutul, Sr., local print and radio advertising, promotional activities at retail, and through point‐of‐purchase displays wherever Yuengling is sold. Based in Pottsville, PA, D.G. Yuengling & Son, Inc., America’s Oldest Brewery, is family owned and operated since 1829. Principal beer brands include Traditional Lager, Light Lager, Lord Chesterfield Ale, Dark Brewed Porter, Original Black & Tan, Premium and Premium Light Beer. 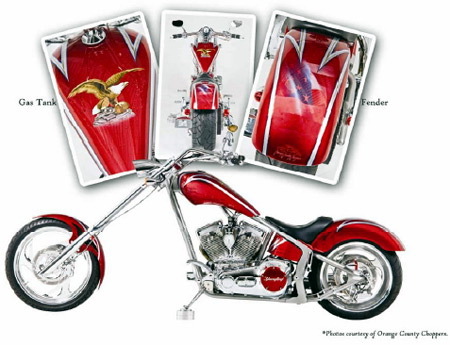 Based in Newburgh, N.Y., Orange County Choppers is regarded as one of the premier builders of custom motorcycles. The OCC brand has become one of the most recognizable worldwide brands and has produced a variety of merchandise such as t‐shirts, hats, diecasts, and more. The OCC shop and its founder, Paul Teutul Sr, are featured on the TLC television program, American Chopper, which airs on Thursday nights at 9pm ET/PT. For more information, visit www.orangecountychoppers.com. The Intrepid Fallen Heroes Fund is a leader in supporting the men and women of the armed forces and their families. The Fund has raised over $120 million in support for the families of military personnel lost in service to our nation, and for severely wounded military personnel and veterans. The Center for the Intrepid for amputee and severe burn patients and National Intrepid Center of Excellence for traumatic brain injury are critical elements of today’s military health care system. These efforts are funded entirely with donations from hundreds of thousands of individuals. 100% of contributions raised by the Intrepid Fallen Heroes Fund go towards these programs. Please give today to help those who have sacrificed so much in service to our nation.